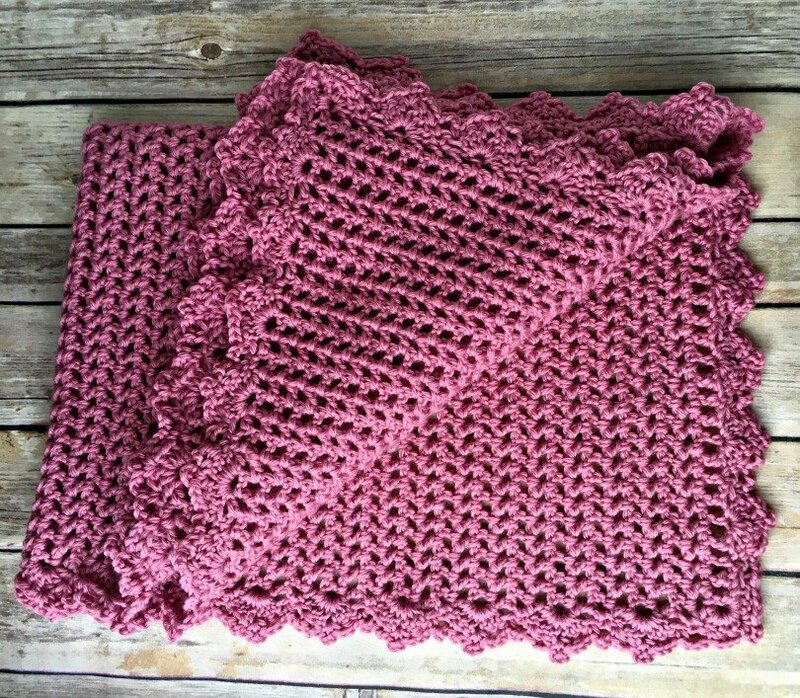 Pretty in Pink Heirloom Baby Blanket - Free Crochet Pattern - love. life. yarn. Row 1: Dc in 4th ch from hook, *ch 1, skip next ch, dc in next ch; repeat from * to end;turn. Rows 2-72: Ch 3, dc in first ch-1 space, *ch 1, dc in next ch-1 space; repeat from *, end ch 1, dc in top of t-ch of row below; turn. Do not fasten off for border. Round 1: Ch 3, 2 dc in same st, skip next dc, *sc in next dc, skip next dc, shell in next dc; repeat from * to corner, shell in corner; repeat from * working in every other row around edge of blanket to last corner, dc 3 in corner, ch 1, join with sl st to t-ch; turn. Round 2: Sl st in ch-1 sp, *ch 3, sc in ch-1 sp, sc in last dc of shell, ch 3, skip sc, sc in first st of next shell, ch 3, sc in ch-1 space; repeat from * to end. That’s it! Quick and easy with a great result. I hope you’ve enjoyed this free pattern – be sure to check out my other FREE baby blanket patterns! Aw that’s so pretty. 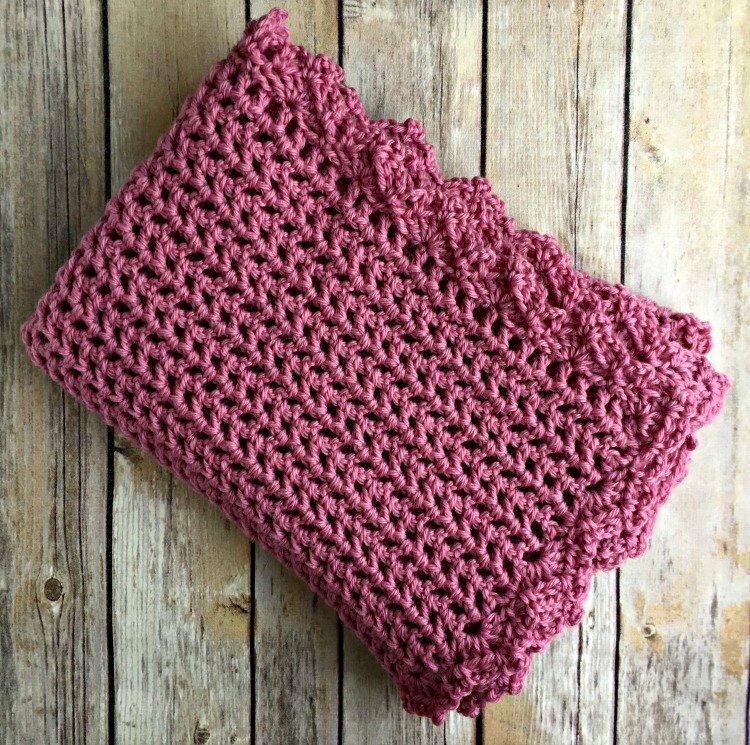 And Congratulations on your new addition to the family..
Hi Amanda, Is there a Multiple for this pattern so I can make it wider. Thanks in advance. Barbara Ann. Absolutely! This pattern is a multiple of 2 sts plus 4. What does t-ch stand for? Ch means chain. The t is what has me stumped. Could you explain please. This is in the body of your instructions. The abbreviation t-ch stands for turning chain. You just work into the chain from the row before, treating it like a dc.